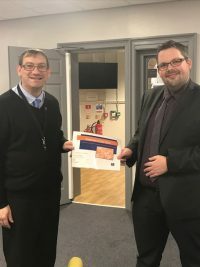 Account Manager for our Wirral team, Mark Monteith was delighted to present Simon Piercy with the Employee of the Term award. Simon has been working at the University Cathedral Free School where he has been working most of the term. “Simon has been worth his weight in gold and has had a massive impact in his role”. Mark Monteith, Primary Recruitment Consultant, New Directions.